2. “At that time Herod the tetrarch heard of the fame of Jesus.” (Matt. xiv. 1). For Herod the king, this man’s father, he that slew the children, was dead. But not without a purpose doth the evangelist signify the time, but to make thee observe also the haughtiness of the tyrant, and his thoughtlessness, in that not at the beginning did he inform himself about Christ, but after a very long time. For such are they that are in places of power, and are encompassed with much pomp, they learn these things late, because they do not make much account of them. But mark thou, I pray thee, how great a thing virtue is, that he was afraid of him even when dead, and out of his fear he speaks wisely even concerning a resurrection. “For he said,” it is mentioned, “unto his servants, This is John, whom I slew, he is risen from the dead, and therefore the mighty powers do work in him.” (Matt. xiii. 2). Seest thou the intensity of his fear? for neither then did he dare to publish it abroad, but he still speaks but to his own servants. But yet even this opinion savored of the soldier, and was absurd. For many besides had risen from the dead, and no one had wrought anything of the kind. And his words seem to me to be the language both of vanity, and of fear. For such is the nature of unreasonable souls, they admit often a mixture of opposite passions. But Luke affirms that the multitudes said, “This is Elias, or Jeremias, or one of the old prophets,” (Luke ix.) but he, as uttering forsooth something wiser than the rest, made this assertion. But it is probable that before this, in answer to them that said He was John (for many had said this too), he had denied it, and said, “I slew him,” priding himself and glorying in it. For this both Mark and Luke report that he said, “John I beheaded.” (Mark vi. 16). But when the rumor prevailed, then he too saith the same as the people. But Mark saith, that Herod exceedingly honored the man, and this, when reproved. (Mark vi. 20.) So great a thing is virtue. And wherefore doth he not address his discourse at all to her, but to the man? Because it depended more on him. But see how inoffensive he makes his accusation, as relating a history rather than bringing a charge. 4. “But when Herod’s birth-day was kept,” saith he, “the daughter of Herodias danced before them, and pleased Herod.” (Matt. xiii. 6). O diabolical revel! O satanic spectacle! O lawless dancing! and more lawless reward for the dancing. For a murder more impious than all murders was perpetrated, and he that was worthy to be crowned and publicly honored, was slain in the midst, and the trophy of the devils was set on the table. Her reproach is twofold; first, that she danced, then that she pleased him, and so pleased him, as to obtain even murder for her reward. Seest thou how savage he was? how senseless? how foolish? in putting himself under the obligation of an oath, while to her he gives full power over her request. But when he saw the evil actually ensuing, “he was sorry,” (Matt. Xiii. 9.) it is said; and yet in the first instance he had put him in bonds. Wherefore then is he sorry? Such is the nature of virtue, even amongst the wicked admiration and praises are its due. But alas for her madness! When she too ought to admire, yea, to bow down to him, for trying to redress her wrong, she on the contrary even helps to arrange the plot, and lays a snare, and asks a diabolical favor. But he was afraid “for the oath’s sake,” it is said, “and them that sat at meat with him.” And how didst thou not fear that which is more grievous? Surely if thou wast afraid to have witnesses of thy perjury, much more oughtest thou to fear having so many witnesses of a murder so lawless. But as I think many are ignorant of the grievance itself, whence the murder had its origin, I must declare this too, that ye may learn the wisdom of the lawgiver. What then was the ancient law, which Herod indeed trampled on, but John vindicated? The wife of him that died childless was to be given to his brother. (Deut. xxv. 5.) For since death was an incurable ill, and all was contrived for life’s sake; He makes a law that the living brother should marry her, and should call the child that is born by the name of the dead, so that his house should not utterly perish. For if the dead were not so much as to leave children, which is the greatest mitigation of death, the sorrow would be without remedy. Therefore you see, the lawgiver devised this refreshment for those who were by nature deprived of children, and commanded the issue to be reckoned as belonging to the other. But when there was a child, this marriage was no longer permitted. “And wherefore?” one may say, “for if it was lawful for another, much more for the brother.” By no means. For He will have men’s consanguinity extended, and the sources multiplied of our interest in each other. Why then, in the case also of death without offspring, did not another marry her? Because it would not so be accounted the child of the departed; but now his brother begetting it, the fiction became probable. And besides, any other man had no constraining call to build up the house of the dead, but this had incurred the claim by relationship. Forasmuch then as Herod had married his brother’s wife, when she had a child, therefore John blames him, and blames him with moderation, showing together with his boldness, his consideration also. But mark thou, I pray thee, how the whole theatre was devilish. For first, it was made up of drunkenness and luxury, whence nothing healthful could come. Secondly, the spectators in it were depraved, and he that gave the banquet the worst transgressor of all. Thirdly, there was the irrational pleasure. Fourthly, the damsel, because of whom the marriage was illegal, who ought even to have hid herself, as though her mother were dishonored by her, comes making a show, and throwing into the shade all harlots, virgin as she was. And the time again contributes no little to the reproof of this enormity. For when he ought to be thanking God, that on that day He had brought him to light, then he ventures upon those lawless acts. When one in chains ought to have been freed by him, then he adds slaughter to bonds. Such was the value he set upon his royal power; so was he once for all made captive by his passion, as to give up his kingdom for a dance. vilifying, reviling, insulting. But not so the saints; they on the contrary mourn for such as sin, rather than curse them. 8. This then let us also do, and let us weep for Herodias, and for them that imitate her. For many such revels now also take place, and though John be not slain, yet the members of Christ are, and in a far more grievous way. For it is not a head in a charger that the dancers of our time ask, but the souls of them that sit at the feast. For in making them slaves, and leading them to unlawful loves, and besetting them with harlots, they do not take off the head, but slay the soul, making them adulterers, and effeminate, and whoremongers. For though the daughter of Herodias be not present, yet the devil, who then danced in her person, in theirs also holds his choirs now, and departs with the souls of those guests taken captive. But if ye are able to keep clear of drunkenness, yet are ye partakers of another most grievous sin; such revels being also full of much rapine. For look not, I pray thee, on the meats that are set before them, nor on the cakes; but consider whence they are gathered, and thou wilt see that it is of vexation, and covetousness, and violence, and rapine. “Nay, ours are not from such sources,” one may say. God forbid they should be: for neither do I desire it. Nevertheless, although they be clear of these, not even so are our costly feasts freed from blame. Hear, at all events, how even apart from these things the prophet finds fault with them, thus speaking, “Woe to them that drink wine racked off, and anoint themselves with the chief ointments.” (Amos vi. 6, LXX.) Seest thou how He censures luxury too? For it is not covetousness which He here lays to their charge, but prodigality only. And thou eatest to excess, Christ not even for need; thou various cakes, He not so much as dry bread; thou drinkest Thasian wine, but on Him thou hast not bestowed so much as a cup of cold water in His thirst. Thou art on a soft and embroidered bed, but He is perishing with the cold. Wherefore, though the banquets be clear from covetousness, yet even so are they accursed, because, while for thy part thou doest all in excess, to Him thou givest not even His need; and that, living in luxury upon things that belong to Him. Why, if thou wert guardian to a child, and having taken possession of his goods, were to neglect him in extremities, thou wouldest have ten thousand accusers, and wouldest suffer the punishment appointed by the laws; and now having taken possession of the goods of Christ, and thus consuming them for no purpose, dost thou not think thou wilt have to give account? 9. And these things I say not of those who introduce harlots to their tables (for to them I have nothing to say, even as neither have I to the dogs), nor of those who cheat some, and pamper others (for neither with them have I anything to do, even as I have not with the swine and with the wolves); but of those who enjoy indeed their own property, but do not impart thereof to others; of those who spend their patrimony at random. For neither are these clear from reprehension. For how, tell me, wilt thou escape reproving and blame, while thy parasite is pampered, and the dog that stands by thee, but Christ’s worth appears to thee even not equal to theirs? when the one receives so much for laughter’s sake, but the other for the Kingdom of Heaven not so much as the smallest fraction thereof. And while the parasite, on saying something witty, goes away filled; this Man, who hath taught us, what if we had not learnt we should have been no better than the dogs,—is He counted unworthy of even the same treatment with such an one? Dost thou shudder at being told it? Shudder then at the realities. Cast out the parasites, and make Christ to sit down to meat with thee. If He partake of thy salt, and of thy table, He will be mild in judging thee: He knows how to respect a man’s table. Yea, if robbers know this, much more the Lord. Think, for instance, of that harlot, how at a table He justified her, and upbraids Simon, saying, “Thou gavest me no kiss.” (Luke vii. 54.) I say, if He feed thee, not doing these things, much more will He reward thee, doing them. Look not at the poor man, that he comes to thee filthy and squalid, but consider that Christ by him is setting foot in thine house, and cease from thy fierceness, and thy relentless words, with which thou art even aspersing such as come to thee, calling them impostors, idle, and other names more grievous than these. And think, when thou art talking so, of the parasites; what kind of works do they accomplish? in what respect do they profit thine house? Do they really make thy dinner pleasant to thee? pleasant, by their being beaten and saying foul words? Nay, what can be more unpleasing than this, when thou smitest him that is made after God’s likeness, and from thine insolence to him gatherest enjoyment for thyself, making thine house a theatre, and filling thy banquet with stage-players, thou who art well born and free imitating the actors with their heads shaven? These things then dost thou call pleasure, I pray thee, which are deserving of many tears, of much mourning and lamentation? And when it were fit to urge them to a good life, to give timely advice, dost thou lead them on to perjuries, and disorderly language, and call the thing a delight? and that which procures hell, dost thou account a subject of pleasure? Yea, and when they are at a loss for witty sayings, they pay the whole reckoning with oaths and false swearing. Are these things then worthy of laughter, and not of lamentations and tears? Nay, who would say so, that hath understanding? And this I say, not forbidding them to be fed, but not for such a purpose. Nay, let their maintenance have the motive of kindness, not of cruelty; let it be compassion, not insolence. Because he is a poor man, feed him; because Christ is fed, feed him; not for introducing satanical sayings, and disgracing his own life. Look not at him outwardly laughing, but examine his conscience, and then thou wilt see him uttering ten thousand imprecations against himself, and groaning, and wailing. And if he do not show it, this also is due to thee. 10. Let the companions of thy meals then be men that are poor and free, not perjured persons, nor stage-players. And if thou must needs ask of them a requital for their food, enjoin them, should they see anything done that is amiss, to rebuke, to admonish, to help thee in thy care over thine household, in the government of thy servants. Hast thou children? Let these be joint fathers to them, let them divide thy charge with thee, let them yield thee such profits as God loveth. Engage them in a spiritual traffic. And if thou see one needing protection, bid them succor, command them to minister. By these do thou track the strangers out, by these clothe the naked, by these send to the prison, put an end to the distresses of others. Let them give thee, for their food, this requital, which profits both thee and them, and carries with it no condemnation. Hereby friendship also is more closely riveted. For now, though they seem to be loved, yet for all that they are ashamed, as living without object in thy house; but if they accomplish these purposes, both they will be more pleasantly situated, and thou wilt have more satisfaction in maintaining them, as not spending thy money without fruit; and they again will dwell with thee in boldness and due freedom, and thy house, instead of a theatre, will become to thee a church, and the devil will be put to flight, and Christ will enter, and the choir of the angels. For where Christ is, there are the angels too, and where Christ and the angels are, there is Heaven, there is a light more cheerful than this of the sun. And if thou wouldest reap yet another consolation through their means, command them, when thou art at leisure, to take their books and read the divine law. They will have more pleasure in so ministering to you, than in the other way. For these things add respect both to thee and to them, but those bring disgrace upon all together; upon thee as an insolent person and a drunkard, upon them as wretched and gluttonous. For if thou feed in order to insult them, it is worse than if thou hadst put them to death; but if for their good and profit, it is more useful again than if thou hadst brought them back from their way to execution. And now indeed thou dost disgrace them more than thy servants, and thy servants enjoy more liberty of speech, and freedom of conscience, than they do; but then thou wilt make them equal to the angels. Set free therefore both them and thine own self, and take away the name of parasite, and call them companions of thy meals; cast away the appellation of flatterers, and bestow on them that of friends. With this intent indeed did God make our friendships, not for evil to the beloved and loving, but for their good and profit. But these friendships are more grievous than any enmity. For by our enemies, if we will, we are even profited; but by these we must needs be harmed, no question of it. Keep not then friends to teach thee harm; keep not friends who are enamored rather of thy table than of thy friendship. For all such persons, if thou retrench thy good living, retrench their friendship too; but they that associate with thee for virtue’s sake, remain continually, enduring every change. And besides, the race of the parasites doth often take revenge upon thee, and bring upon thee an ill fame. Hence at least I know many respectable persons to have got bad characters, and some have been evil reported of for sorceries, some for adulteries and corrupting of youths. For whereas they have no work to do, but spend their own life unprofitably; their ministry is suspected by the multitude as being the same with that of corrupt youths. Therefore, delivering ourselves both from evil report, and above all from the hell that is to come, and doing the things that are well-pleasing to God, let us put an end to this devilish custom, that “both eating and drinking we may do all things to the glory of God,” (1 Cor. x. 31) and enjoy the glory that cometh from Him; unto which may we all attain, by the grace and love towards man of our Lord Jesus Christ, to whom be glory and might, now and ever, and world without end. Amen. For more on the Beheading of the Precious Forerunner, see: http://full-of-grace-and-truth.blogspot.com/2009/08/beheading-of-holy-glorious-prophet.html. 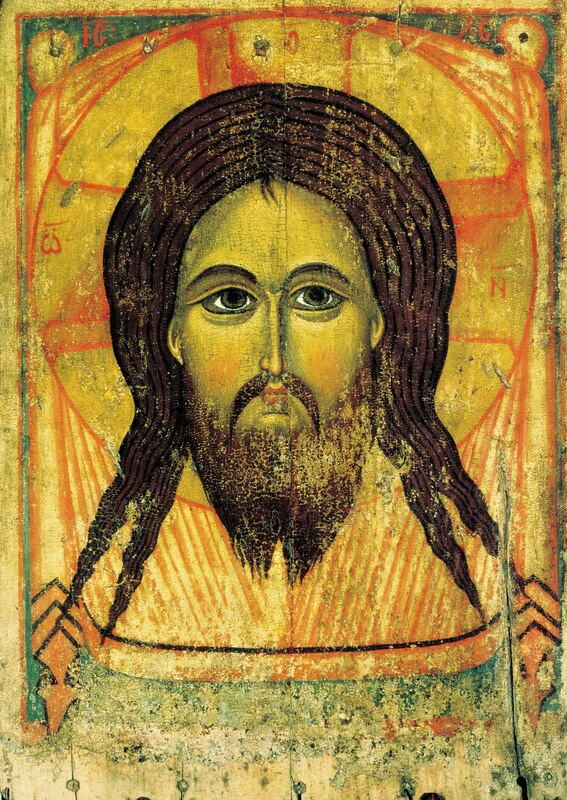 For a homily by St. Justin Popovitch on this feast, see: http://www.johnsanidopoulos.com/2010/08/beheading-of-john-prophet-and.html. The memory of the just is observed with hymns of praise; for you suffices the testimony of the Lord, O Forerunner. You have proved to be truly more venʹrable than the Prophets, since you were granted to baptize in the river the One whom they proclaimed. Therefore, when for the truth you had contested, rejoicing, to those in Hades you preached the Gospel, that God was manifested in the flesh, and takes away the sin of the world, and grants to us the great mercy. "The Monk Avraamii (Abraham) of Smolensk, a preacher of repentance and the impending Dread Last Judgement, was born in the mid-XII Century at Smolensk of rich parents, who before him had 12 daughters, and they besought God for a son. From childhood he grew up in the fear of God, he was often in church and had the opportunity to read books. The parents hoped that their only son would enter into marriage and continue their illustrious lineage, but he sought after a different life. After the death of his parents, having given away all his wealth to monasteries, to churches and to the destitute, the saint walked through the city in rags, beseeching God to show him the way to salvation. He accepted tonsure in a monastery of the MostHoly Mother of God, five versts from Smolensk, at the locale of Selischa. Having passed through various obediences there, the monk fervently occupied himself with the copying of books, culling spiritual riches from them. The Smolensk prince Roman Rostislavich (+ 1170) started a school in the city, in which they taught not only in Slavonic, but also out of Greek and Latin books. The prince himself had a large collection of books, which the Monk Avraamii made use of. 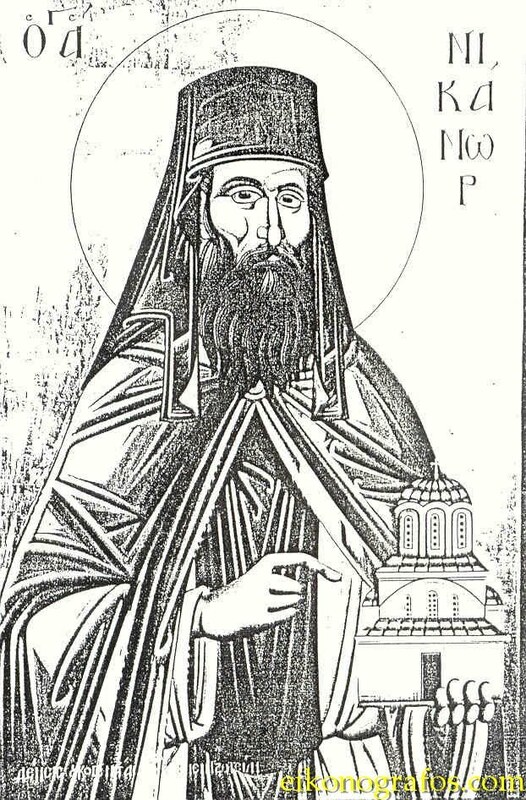 He had asceticised for more than 30 years at the monastery, when in the year 1198 the hegumen persuaded him to accept the dignity of presbyter. Every day he made Divine Liturgy and fulfilled the obedience of clergy not only for the brethren, but also for the laypeople. Soon the monk became widely known. This aroused the envy of the brethren, and then of the hegumen also, and 5 years later the monk was compelled to transfer to the Cross-Exaltation monastery in Smolensk itself. From the offerings by the devout he embellished the cathedral church of the poor monastery with icons, and with curtains and candle-stands. He himself inscribed two icons on themes, which most of all concerned him: on the one he depicted the Dread Last Judgement, and on the other – the suffering of the trials of life. Lean and pale from extreme toil, the ascetic in priestly garb resembled in appearance Saint Basil the Great. The saint was strict both towards himself, and towards his spiritual children. He preached constantly in church and to those coming to him in his cell, conversing with rich and poor alike. The city notables and the clergy demanded of Bishop Ignatii to bring the monk to trial, accusing him in the seduction of women and the tempting of his spiritual children. But even more terrible were the accusations against him, of heresy and the reading of forbidden books. For this they proposed to drown or burn the ascetic. At the trial by the prince and the bishop, the monk answered all the false accusations, but despite this, they forbade him to serve as a priest and returned him to his former monastery in honour of the MostHoly Mother of God. A terrible drought occurred in consequence of God's wrath over the unjust sentence, and only when Sainted Ignatii put forth a pardon of the Monk Avraamii permitting him to serve and preach, did the rain again fall on the Smolensk lands. The bishop Saint Ignatii built a new monastery, in honour of the Placing of the Robe of the MostHoly Mother of God, and he entrusted the guidance of it to the Monk Avraamii, and he himself settled into it, having retired because of age from the diocese. Many were desirous to enter under the guidance of the Monk Avraamii, but he examined them very intensely and only after great investigation, so that at his monastery there were but 17 brethren. The Monk Avraamii, after the death of Saint Ignatii, having become his spiritual friend, – even moreso than before urged the brethren to reminisce about death and to pray day and night, that they be not condemned in the Judgement by God. The Monk Avraamii died after the year 1224, having spent 50 years in monasticism. Already at the end of the XIII Century there had been compiled a service to him, conjointly with his student the Monk Ephrem. The terrible Mongol-Tatar invasion, seen as the wrath of God for sin, not only did not stifle the memory of the Monk Avraamii of Smolensk, but rather was a reminder to people of his calling to repentance and recollection of the dread Last Judgement." "Magnanimous forgiveness of slanderers and prayer for them is a characteristic of Christian saints who do not ascribe all the slanders against themselves to men but rather to demons, the main instigators of every slander as well as every sin in general. St. Abraham of Smolensk was slandered by envious priests to the prince and the bishop as a deceiver, magician and hypocrite. The slanders sought nothing less than to have him burned. The prince and the bishop believed the slanderers and Abraham was banished from Smolensk and was forbidden to exercise his priestly functions. During the entire time of his investigation and trial, Abraham repeated the prayer of St. Stephen, the first martyr: "Lord, lay not this sin to their charge" (Acts of the Apostles 7:60). Later it was established that all of the accusers against Abraham lied and slandered. The infuriated prince wanted to severely punish the slanderers and the bishop wanted to excommunicate them from the Church but the holy Abraham fell on his knees before the bishop and, with tears, begged him to forgive them. Abraham did not want to return to his monastery nor to begin again to exercise his priestly functions until his slanderers were shown mercy and released." His neighbors, he loves as himself. For his foes, the mercy of God he implores. The aristocrat and the helpless slave. 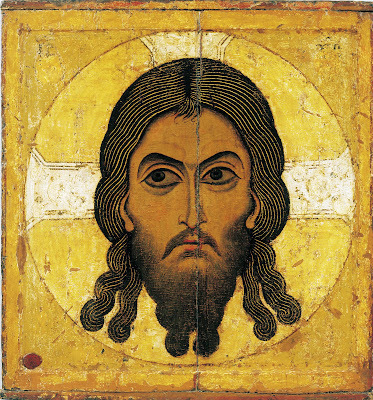 "The Transfer from Edessa to Constantinople of the Icon of our Lord Jesus Christ Not-Made-by-Hands occurred in the year 944. Eusebius, in his HISTORY OF THE CHURCH (I:13), relates that when the Savior was preaching, Abgar ruled in Edessa. He was stricken all over his body with leprosy. Reports of the great miracles worked by the Lord spread throughout Syria (Mt.4:24) and reached even Abgar. Without having seen the Savior, Abgar believed in Him as the Son of God. He wrote a letter requesting Him to come and heal him. He sent with this letter to Palestine his own portrait-painter Ananias, and commissioned him to paint a likeness of the Divine Teacher. Agbar, Ruler of the city of Edessa, to Jesus Saviour, the good physician, who has appeared in Jerusalem, greeting! Ananias arrived in Jerusalem and saw the Lord surrounded by people. He was not able to get close to Him because of the large throng of people listening to the preaching of the Savior. Then he stood on a high rock and attempted to paint the portrait of the Lord Jesus Christ from afar, but this effort was not successful. The Savior saw him, called to him by name and gave him a short letter for Abgar in which He praised the faith of this ruler. He also promised to send His disciple to heal him of his leprosy and guide him to salvation. [Blessed are you, Agbar, who have believed in me, though you have not seen me. For it is written of me that those who have seen me do not believe in me so that those who have not seen me may believe and live. As to what you wrote about my coming to you, it is necessary that I accomplish all that I was sent out to do and, after I have accomplished it, to be taken up to the Father who sent me. 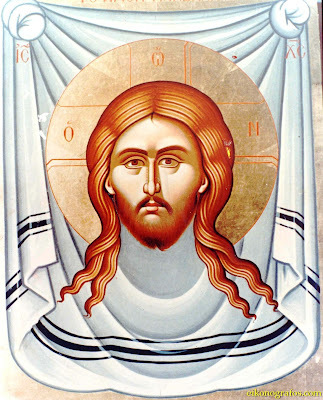 And when I have been taken up I will send you one of my Disciples, named Thaddaios, he will heal your disease and grant you and those with you eternal life and peace, and he will make your city such that no enemy can prevail against it. http://full-of-grace-and-truth.blogspot.com/2009/08/st-thaddeus-holy-apostle-of-seventy-and.html), who preached the Gospel and baptized Abgar and all the people of Edessa. Abgar put the Holy Napkin in a gold frame adorned with pearls, and placed it in a niche over the city gates. 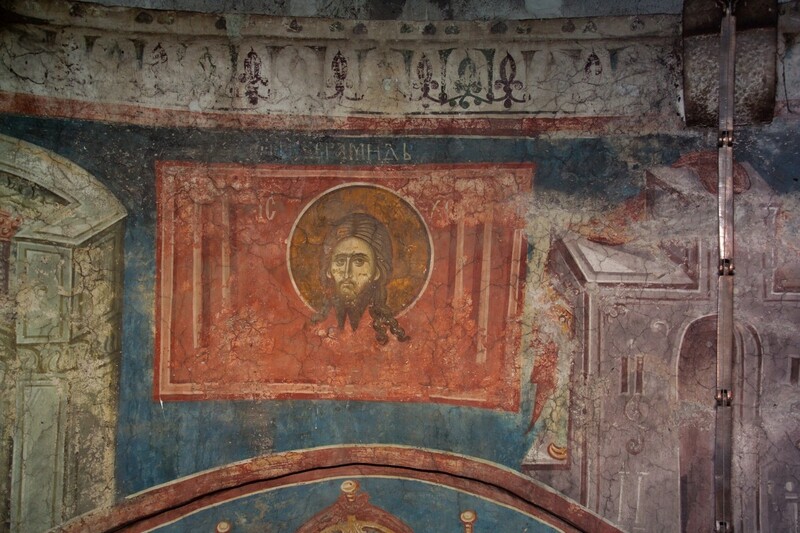 On the gateway above the icon he inscribed the words, "O Christ God, let no one who hopes on Thee be put to shame." For many years the inhabitants kept a pious custom to bow down before the Icon Not-Made-by-Hands, when they went forth from the gates. 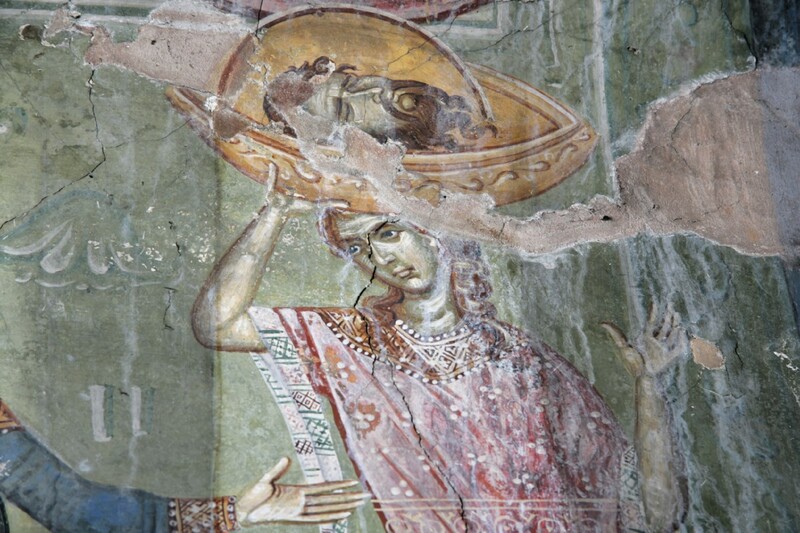 But one of the great-grandsons of Abgar, who later ruled Edessa, fell into idolatry. He decided to take down the icon from the city wall. In a vision the Lord ordered the Bishop of Edessa to hide His icon. The bishop, coming by night with his clergy, lit a lampada before it and walled it up with a board and with bricks. Many years passed, and the people forgot about it. But in the year 545, when the Persian emperor Chozroes I besieged Edessa and the position of the city seemed hopeless, the Most Holy Theotokos appeared to Bishop Eulabius and ordered him to remove the icon from the sealed niche, and it would save the city from the enemy. Having opened the niche, the bishop found the Icon Not-Made-by-Hands: in front of it was burning the lampada, and upon the board closing in the niche, a copy of the icon was reproduced. In the year 630 Arabs seized Edessa, but they did not hinder the veneration of the Holy Napkin, the fame of which had spread throughout all the East. In the year 944, the emperor Constantine Porphyrogenitos (912-959) wanted to transfer the icon to the Constantinople, and he paid a ransom for it to the emir of the city. With great reverence the Icon of the Savior Not-Made-by-Hands and the letter which He had written to Abgar, were brought to Constantinople by clergy. On August 16, the icon of the Savior was placed in the [Pharos] church of the Most Holy Theotokos. There are several traditions concerning what happened later to the Icon Not-Made-by-Hands. According to one, crusaders ran off with it duringtheir rule at Constantinople (1204-1261), but the ship on which the sacred object was taken, perished in the waters of the Sea of Marmora. 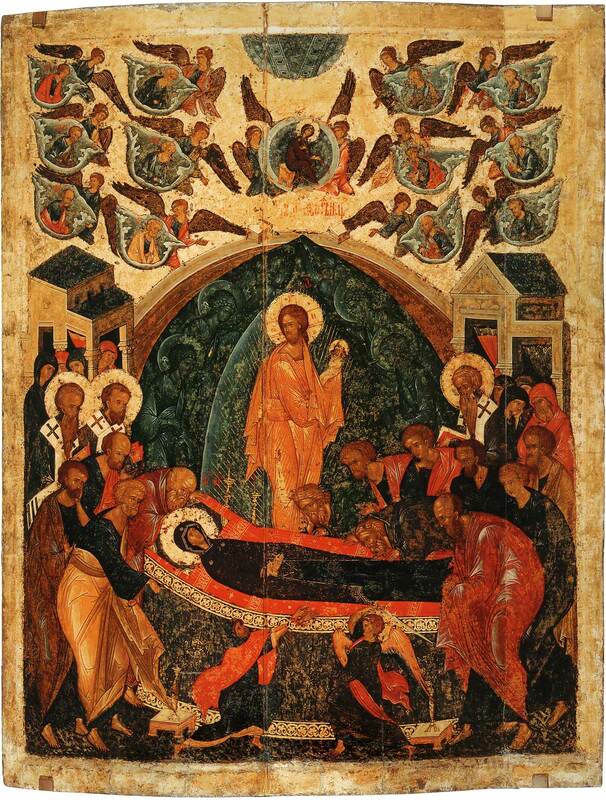 The Feast of the Transfer of the Icon Not-Made-by-Hands, made together with the Afterfeast of the Dormition, they call the third-above Savior Icon, the "Savior on Linen Cloth." The particular reverence of this Feast in the Russian Orthodox Church is also expressed in iconography, and the Icon Not-Made-by-Hands was one of the most widely distributed." 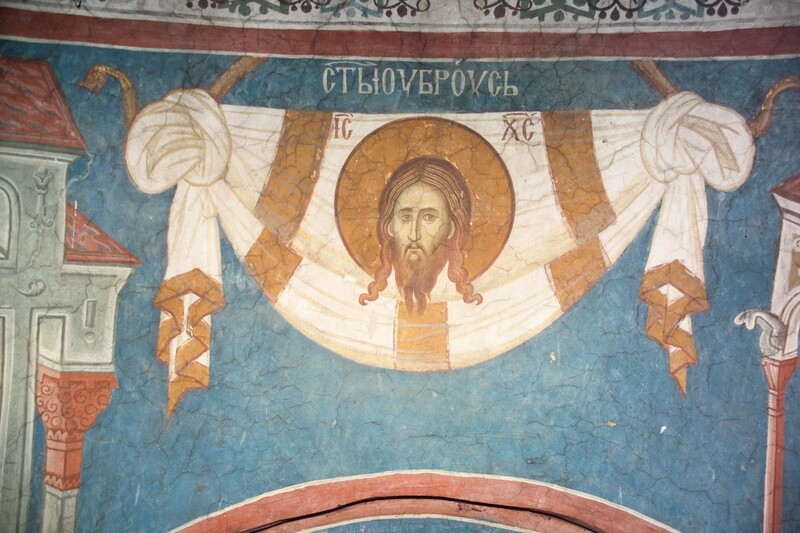 Orthodox tradition has long seen the Mandylion (the cloth that Christ imprinted His image on in life) as distict from the burial cloths of Christ. 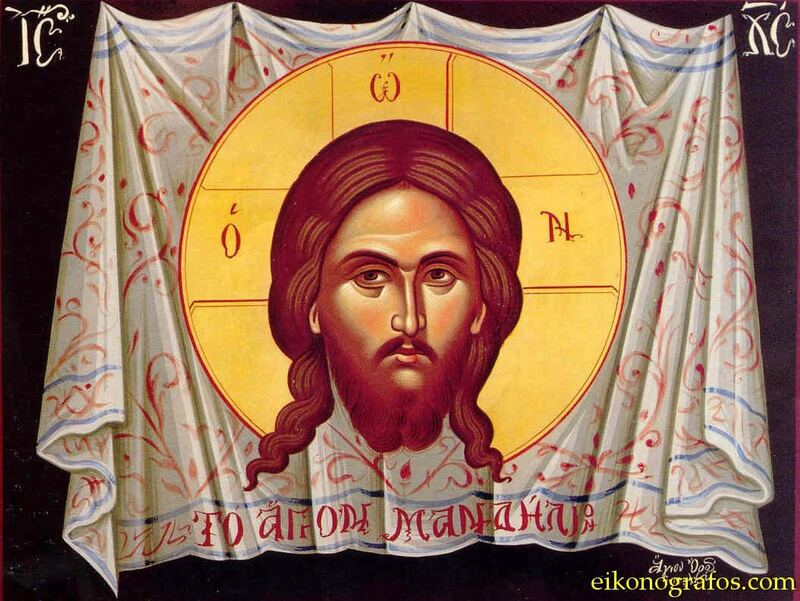 A few modern researchers (heterodox and some Orthodox) however have proposed that the Mandylion of Orthodox tradition is in fact the burial shroud of Christ (i.e. the Shroud of Turin) upon which His image was imprinted. "A 6th century text refers to the Mandylion as a "tetradiplon'--"doubled in four." A most curious choice of word, according to Cambridge University's Professor Lampe, editor of the 'Lexicon of Patristic Greek'; in all literature it occurs only in association with the image of Edessa, being scarcely, therefore, an idle turn of phrase." As Wilson convincingly suggests, if the Shroud of Turin were folded in this manner, i.e., doubled four times, the viewer would see nothing but the head. 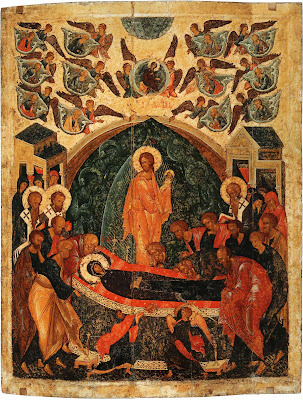 And if this folded cloth were attached to a board (as the Mandylion is said to have been), those who venerated the holy image could well have been ignorant of the fact that they were looking at but a portion of what was actually a full-length image, particularly if this image had been sealed up for so many years. But none of this, as fascinating as it is, has been conclusively proven. 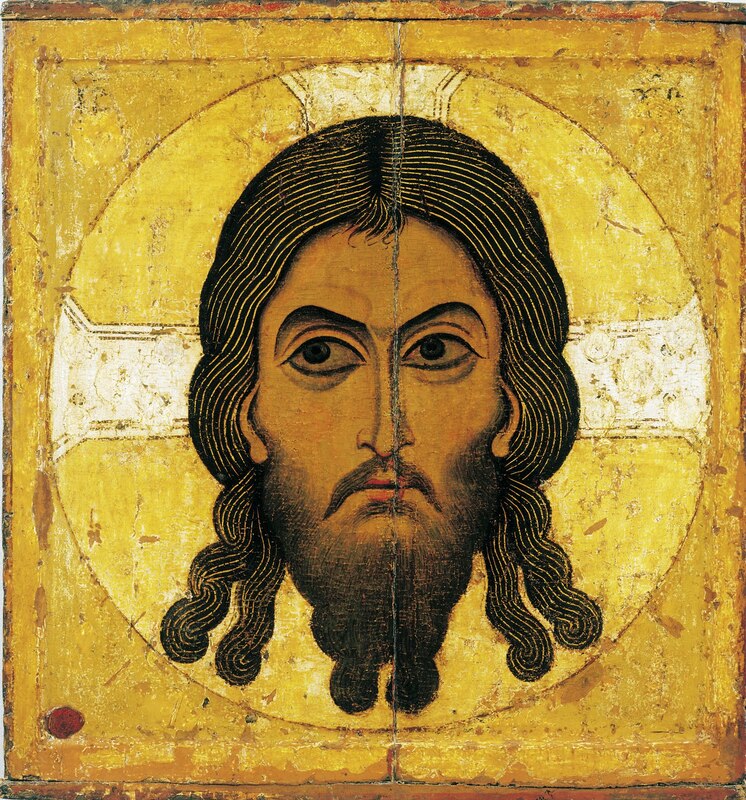 We can only say that the historical evidence thus far uncovered, and the scientific evidence of the Shroud of Turin itself, does indeed suggest this explanation, But the point is that if the Shroud is also the Mandylion, not only does it have an Orthodox history, but it also explains why it seems to have no separate feast or service." 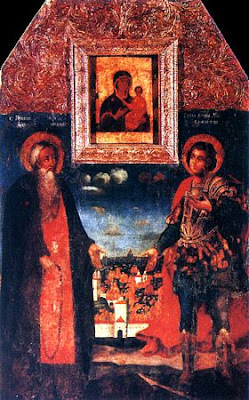 Apolytikion of the Holy Icon. Tone 2. We venerate your most pure icon, loving Lord, as we ask pardon of our offences, Christ God. For by your own choice you were well-pleased to ascend the Cross in the flesh, to deliver from the slavery of the enemy those whom you had fashioned; therefore with thanksgiving we cry to you: You have filled all things with joy, our Saviour, by coming to save the world. Stichera Prosomia of the Holy Icon. Tone 2. With that garlands of praise. With what eyes shall we who are born of earth look upon your image, which the armies of the Angels cannot look at without fear as it blazes with divine light? For it departs to-day from the land of unbelievers and by divine decree comes to dwell in the Queen of cities and among a people of true religion. At its entry Kings rejoice, O Christ, falling down before it with fear and faith. With what hands shall we creatures of dust touch your Image, O Word? We who are stained by faults touch you, our sinless God? We who live in filth touch you the unapproachable? The Cherubim tremble and hide their gaze; the Seraphim cannot bear to see your glory; creation serves you with fear. Do not then condemn us, O Christ, who unworthily greet from faith your dread appearance. Once again the godlike day of the Master’s festival is here; for he who is seated in the highest has now clearly visited us through his honoured Image; he who is unseen by the Cherubim above appears through painting to those to whom he has become like, formed ineffably by the immaculate finger of the Father according to his likeness. As we worship it with faith and love we are sanctified. I honour the imprint of your face, O Saviour. The One who before was without a body, by the Father’s good pleasure did not refuse to be formed with a body like ours, and has granted us the grace of a divine representation. The unchanging nature, the most precise definition of the Father, having entered mortal flesh, left behind for us on earth his characteristics when he went back to heaven. By your revered sufferings, O Christ, you justified your inheritance, which had been shaken by the deception of the Enemy, making it stable by the representation of your form. Taking flesh from your pure loins in a manner above nature, O all-blameless, the One who gives being to all mortals became visible, yet not abandoning what he was before. 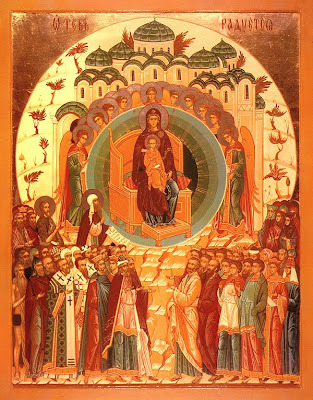 On the same day [August 16] memorial of the entry of the Image Not Made By Hand of our Lord and God and Saviour Jesus Christ, brought from the city of the Edessenes to this god-protected Queen of cities. A final burial cloth you wore when dead. By hand now bears your form not made by hand. All these evils of creation weighed against the fulness of the Holiness of the Theotokos could not sadden God. For only the Lady Theotokos was able to please Him in all things. She alone stands between God and men, who made God the son of men, and men sons of God. Without her intercessions no one, neither angels, nor men could entreat God, for she alone is found on the border between the uncreated and natural creation. She alone is God immediately after God and has second place to the Holy Trinity, as being truly the mother of God in essence. And she alone is not only the protector of the treasury of all the riches of the Godhead, but she is the distributor to all angels and men, all those gifts from God to the supernatural creation, illumination and divine and spiritual gifts. And there is no one who cannot call upon her with faith and not be heard with compassion. This Son of God and beloved son of the Virgin gave us His mother (and thus our mother) as such an advocate, to help us towards our salvation. When God's Mother ascended to the Mount of Olives to pray, the trees bent to venerate her. 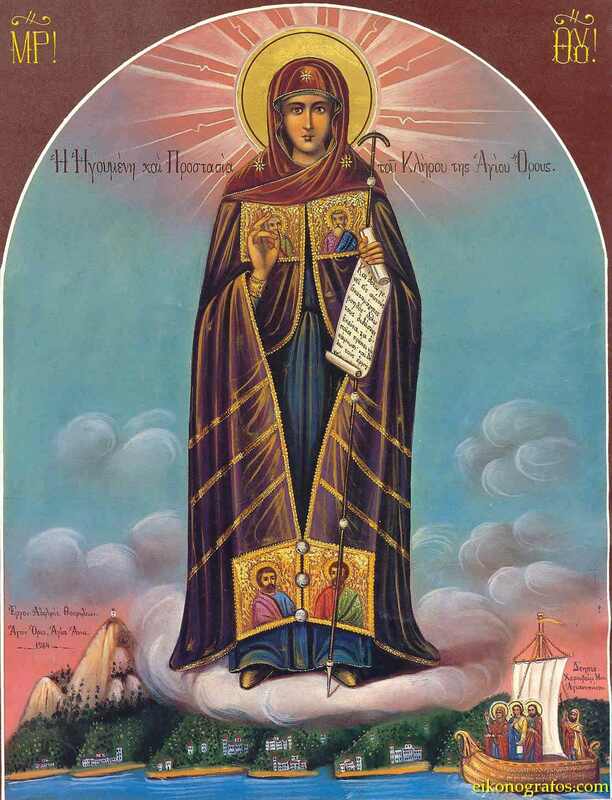 According to the general hagiorite tradition, the Lady Theotokos with St. John the Theologian were traveling by boat from Palestine to Cyprus to visit St. Lazarus (who was raised from the dead by Christ). Because of a great storm and in a supernatural manner, however, the boat reached Athos and specifically the bay of Klementos in the Monastery of Iveron. 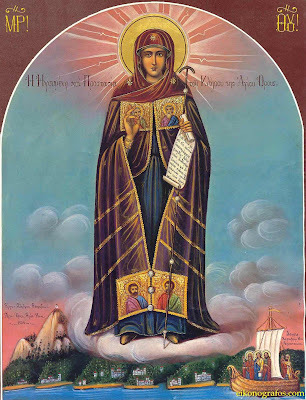 There the inhabitants of Athos, led by divine Providence, hastened to receive the mother of our Lord, Panagia, and having heard her teaching, they accepted Christianity. 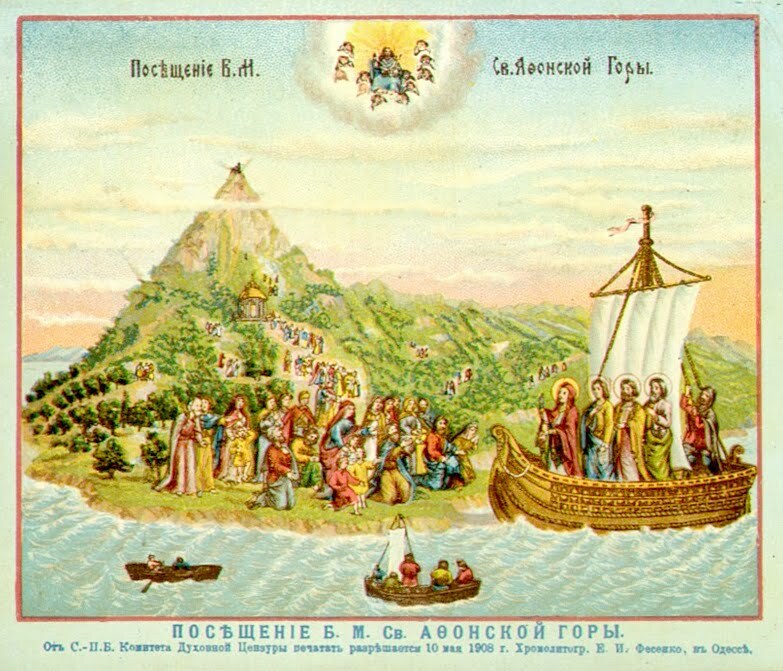 It is further said by tradition that when the boat of the Panagia approached the Holy Mountain, the large statue of Dios at the summit of the Mountain was destroyed, and the remaining idols were crushed. The peak of Athos and all the trees and the houses bent to venerate towards the place of the bay of Klementos where Panagia's boat was coming. 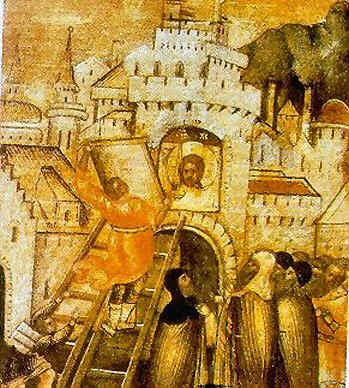 The arrival of the Theotokos at the Mountain is mentioned by codices L' 66 and I' 31 of the Library of Great Lavra Monastery. When the apostles cast lots for the regions where they would preach, Panagia sought to take a lot to preach the Gospel. Her lot showed the region of Iberia. The archangel Gabriel however appeared and said to the Virgin that her true region would be Macedonia and the Mount of Athos. When their boat entered the bay, there was great turmoil on the Mountain, and then the inhabitants came and asked John how all of these things happened, and with which power. And he explained to them and preached the word of God, speaking in Greek, though he was a Hebrew. When God apportioned the nations according to his Angels, knowing that you, O Virgin, would be his immaculate Mother, he then allotted you this great and beautiful mountain as an inalienable inheritance. The Righteous Nikanor was born in 1491 in Thessaloniki of wealthy parents, John and Maria, who had great difficulty having children. Their faith however, displayed by their prayers and good deeds, helped them after years bear a son named Nicholas (the baptismal name of the Saint). His parents from the beginning tried raise him according to the teachings of the Gospel. When Nicholas was 20 years old, his father died, and after a short time, so did his mother. Having distributed his inheritance to the poor, he began he left for his destination together with the Righteous Dionysios of Olympus. (http://full-of-grace-and-truth.blogspot.com/2010/01/st-dionysios-righteous-of-olympus-and.html) During the journey they roads separated, and the Righteous Nikanor alone reached Mount Kallistratos (known as Vermion Mountain, Grevena), where with much effort he built his ascetical dwelling in the Monastery that was there, and which survives to this day, in the treacherous canyon rocks, on the banks of the Aliakmona river. Besides all of this, he would routinely descend to strengthen the faithful of the surrounding towns and villages, to remain steadfast in their faith, even to end of sacrificing their lives. 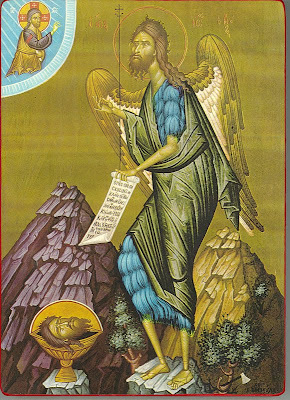 One night when he was praying, he again heard a heavenly voice, which called him to go to the summit of the mountain to find the icon of the Savior, which was hidden during the time of the iconoclasts, and to built in that place a monastery. In reality, the next day, that which was said by the voice was verified, and Nikanor at that place built a church and monastery in the name of the Transfiguration of the Lord. The contribution of the monastery was invaluable during the struggles for independence of Greece, both because of its strategic location, and also its economical support. St. Nikanor fell asleep in the Lord on August 7th 1549, at the age of 58. His sacred relic was buried in the Chapel of the Precious Forerunner. 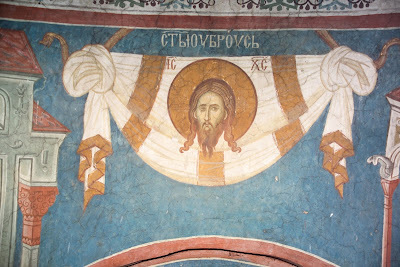 The Monastery of Zavordas was known for its hospitality, and many would come from Grevena, Siatista, Kozani, Serbia, Deskate and other cities in the region of Western Macedonia. This tradition was sacred since the age when the Righteous Nikanor lived. Throughout all his years of service, those who would visit the monastery would always find a plate of food and a glass of wine, from the large stores that existed there. The contribution of the Righteous one was invaluable, both in life and after his repose, as faith in him and the church has shone a great host of miracles up to today, especially regarding healings of plagues and diseases [Another source mentions that the Saint is a protector of shepherds and animals]. 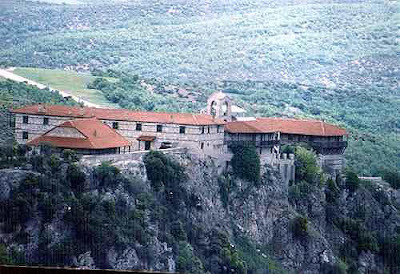 For a video of the Monastery of St. Nikanor, see: http://www.pigizois.net/arxeia/nikanoras.wmv. For more on the Monastery, see: http://www.pigizois.net/ieres_mones/i_m_ag_nikanora/i_m_nikanora.htm, http://blog.katakali.net/?page_id=237. As an Angel in the flesh you lived on earth, and received the crown of victory in the heavens from God, O Righteous one, therefore receiving of the grace of miracles, you ever grant deliverance, O God-bearing Nikanor, to those who hasten to your divine intercessions in faith. 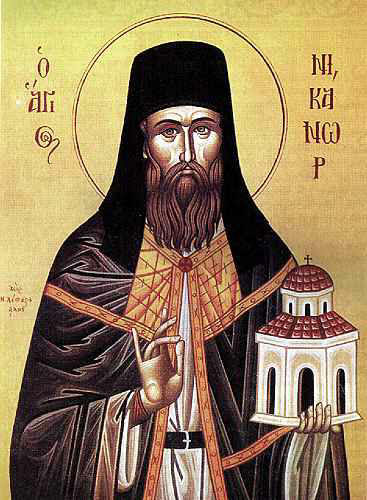 The full service of the Saint in Greek is available here: http://analogion.com/forum/showthread.php?t=10467. 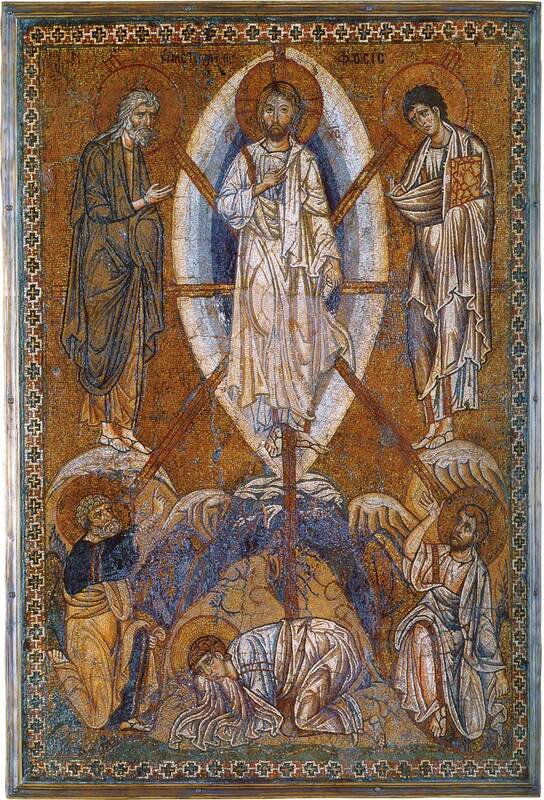 Sermon on the Transfiguration of our Lord and God and Saviour, Jesus Christ. 1. From the land comes the joy of harvest, from the vineyard fruits that give food, and from the Scriptures teaching that gives life. The land has one season for the harvest, and the vineyard has one season for the vintage, but the Scripture when read always overflows with teaching that gives life. The land when it has been harvested lies fallow and the vineyard when the grapes have been picked is unproductive, but when Scripture is harvested the grapes of those who expound it are not lacking in it. It is picked every day and the grape clusters of the hope in it are never exhausted. Let us then draw near to this land and enjoy its life-giving furrows; and let us harvest from it grapes of life, the words of our Lord Jesus Christ, who said to his Disciples, ‘There are some of those standing here who will not taste death until they see the Son of man coming in his glory’. 2. ‘And after six days he took Simon Peter and James and John his brother to a very high mountain and he was transfigured before them, and his face shone like the sun, and his garments became white like light’. 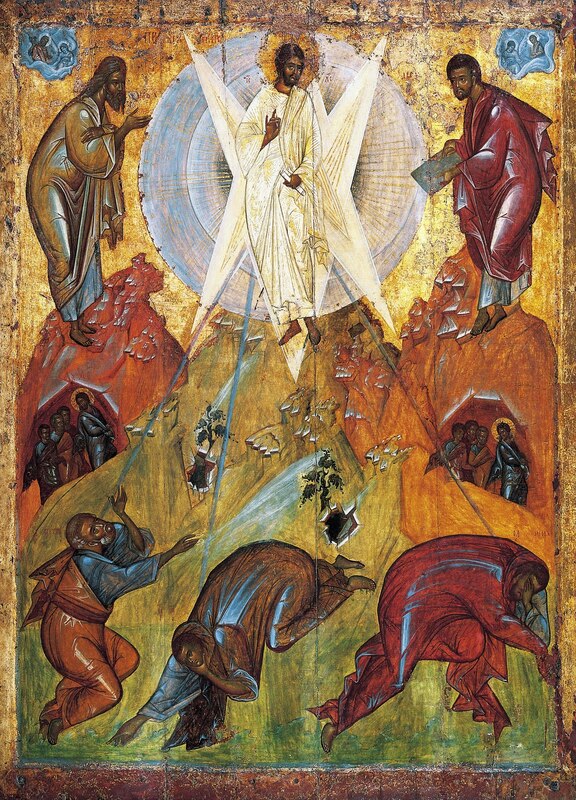 Men whom he said would not taste death until they saw the image of his coming, are those whom he took and led up the mountain and showed them how he was going to come on the last day in the glory of his divinity and in the body of his humanity. 3. He led them up the mountain to show them who the Son is and whose he is. Because when he asked them, ‘Whom do men say the Son of man is?’ They said to him, some Elias, others Jeremias, or one of the Prophets. This is why he leads them up the mountain and shows them that he is not Elias, but the God of Elias; again, that he is not Jeremias, but the one who sanctified Jeremias in his mother’s womb; not one of the Prophets, but the Lord of the Prophets, who also sent them. And he shows them that he is the maker of heaven and earth, and that he is Lord of living and dead. For he gave orders to heaven and brought down Elias, and made a sign to the earth and raised up Moses. 4. He led them up the mountain to show them that he is the Son of God, born from the Father before the ages and in the last times incarnate from the Virgin, as he knows how, born ineffably and without seed, preserving her virginity incorrupt; for wherever God wills it, the order of nature is overcome. For God the Word dwelt in the Virgin’s womb, and the fire of his divinity did not consume the members of the Virgin’s body, but protected them carefully by its nine month presence. He dwelt in the Virgin’s womb, not abhorring the unpleasant smell of nature, and God incarnate came forth from her to save us. 5. He led them up the mountain to show them the glory of the godhead and to make known to them that he is the redeemer of Israel, as he had shown through the Prophets, and they should not be scandalised in him when they saw his voluntary sufferings, which as man he was about to suffer for us. For they knew him as a man, but did not know that he was God. They knew him as son of Mary, going about with them in the world, and he made known to them on the mountain that he was Son of God and God. They saw that he ate and drank, toiled and rested, dozed and slept, things which did not accord with his divine nature, but only with his humanity, and so he took them to the mountain that the Father might call him Son and show that he is truly his Son and that he is God. 6. He led them up the mountain and showed them his kingship before his passion, and his power before his death, and his glory before his disgrace, and his honour before his dishonour, so that, when he was arrested and crucified by the Jews, they might know that he was not crucified through weakness, but willingly by his good pleasure for the salvation of the world. 7. He led them up the mountain and showed the glory of his divinity before the resurrection, so that when he rose from the dead in the glory of his divine nature, they might know that it was not because of his harsh toil that he accepted glory, as if he lacked it, but it was his before the ages with the Father and together with the Father, as he said as he was coming to his voluntary passion, ‘Father, glorify me with the glory which I had with you before the world existed’. 8. 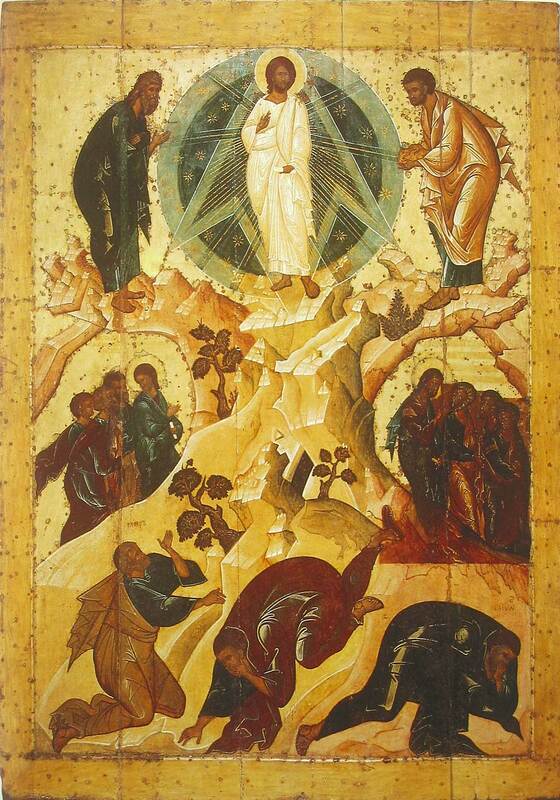 And so on the mountain he showed his Apostles the glory of his divinity, concealed and hidden by his humanity. For they saw his face bright as lightning and his garments white as light. They saw two suns; one in the sky, as usual, and one unusually; one visible in the firmament and lighting the world, and one, his face, visible to them alone. His garments white as light showed that the glory of his divinity flooded from his whole body, and his light shone from all his members. For his flesh did not shine with splendour from without, like Moses, but the glory of his divinity flooded from him. His light dawned and was drawn together in him. Nor did depart somewhere else and leave him, because it did come from another place and adorn him, nor was it for his use. And he did not display the whole depth of his glory, but only as much as the limits of their eyes could encompass. 9. ‘And there appeared to them Moses and Elias talking with him’. And the words that they said to him were such as these: they were thanking him that their words and those of all their fellow Prophets had been fulfilled by his coming. They offered him worship for the salvation which he had wrought for the world for the human race; and that he had fulfilled in reality the mystery they had only sketched. There was joy for the Prophets and the Apostles by this ascent of the mountain. The Prophets rejoiced when they saw his humanity, which they had not known. The Apostles also rejoiced when they saw the glory of his divinity, which they had not known, and heard the voice of the Father bearing witness to his Son; and through this they recognised his incarnation, which was concealed from them. And the witness of the three was sealed by the Father’s voice and by Moses and Elias, who stood by him like servants, and they looked to one another: the Prophets to the Apostles and the Apostles to the Prophets. There the authors of the old covenant saw the authors of the new. Holy Moses saw Simon the sanctified; the steward of the Father saw the administrator of the Son. The former divided the sea for the people to walk in the middle of the waves; the latter raised a tent for the building of the Church. The virgin of the old covenant saw the virgin of the new: [Elias and John;] the one who mounted on the chariot of fire and the one who leaned on the breast of the flame. And the mountain became a type of the Church, and on it Jesus united the two covenants, which the Church received, and made known to us that he is the giver of the two. The one received his mysteries; the other revealed the glory of his works. 12. And while the Disciples were marvelling, out of the cloud a voice was heard from the Father, saying, “This is my beloved Son, in whom I am well-pleased. Listen to him.” At the voice of the Father, Moses returned to his place and Elias returned to his country, and the Apostles fell on their faces to the ground, and Jesus stood alone, because the voice was fulfilled in him alone. The Prophets left and the Apostles fell to the ground, because the Father’s voice in witness, “This is my beloved Son, in whom I am well-pleased. Listen to him”, was not fulfilled in them. The Father taught them that Moses’ dispensation was fulfilled, and that they should listen to the Son, “For Moses, as a servant, spoke what he was ordered to, and he proclaimed what he had been told, and so did all the Prophets, until the one to whom it belongs has come, that is Jesus, who is Son, not servant, Lord and not slave, who is master and not subject, lawgiver and not subject to the law. By divine nature, ‘This is my beloved Son’”. On the mountain the Father made known to the Apostles what was hidden from them. The One Who Is reveals the One Who Is. The Father makes known the Son. 13. At that voice the Apostles fell on their faces to the ground; for there was a fearsome thunder, so that the earth shook at his voice, and they fell to the ground. It showed them that the Father had drawn near; and the Son called them with his voice and raised them up. For as the voice of the Father had thrown them down, so too the voice of the Son, raised them up by the strength of his divinity, which dwelt in his flesh and was united in it without change, both remain indivisibly and unconfusedly in one hypostasis and one person. He did not, like Moses, become resplendent from without, but as God he blazed with glory. For Moses was anointed with splendour by the appearance of his face, while Jesus in his whole body blazed, like the sun with its rays, with the glory of his divinity. 14. And the Father cried out, “This is my beloved Son, in whom I am well-pleased. Listen to him”. The Son was not separated from the glory of the godhead, for the Father and the Son with the Holy Spirit are one nature, one power and once essence and one kingship. And he cried out to one with a simple name and with fearsome glory. And Mary called him ‘son’, not separated from the glory of his divinity by his human nature; for he is one, God who appeared in a body to the world. His glory revealed the divine nature that was from the Father, and his body revealed his human nature that was from Mary; both natures coming together and being united in one hypostasis. Only begotten from the Father, and only begotten from Mary. And anyone who parts him will be parted from his kingdom, and anyone who confounds his natures will perish from his life. May anyone who denies that Mary gave birth to God not see the glory of his divinity; and anyone who denies that he bore a sinless body will be cast out from salvation and from the life that has been given through his body. 15. The facts themselves bear witness and his divine acts of power teach those who doubt that he is true God, and his sufferings show that he is true man. And if those who are feeble in understanding are not fully assured, they will pay the penalty on his dread day. If he was not flesh, why was Mary introduced at all? And if he was not God, whom was Gabriel calling Lord? If he was not flesh, who was lying in the manger? And if he was not God, whom did the Angels come down and glorify? If he was not flesh, who was wrapped in swaddling clothes? And if he was not God, whom did the shepherds worship? If he was not flesh, whom did Joseph circumcise? And if he was not God, in whose honour did the star speed through the heavens? If he was not flesh, whom did Mary suckle? And if he was not God, to whom did the Magi offer gifts? If he was not flesh, whom did Symeon carry in his arms? And if he was not God, to whom did he say, “Let me depart in peace”? If he was not flesh, whom did Joseph take and flee into Egypt? And if he was not God, in whom were words “Out of Egypt I have called my Son” fulfilled? If he was not flesh, whom did John baptise? And if he was not God, to whom did the Father from heaven say, “This is my beloved Son, in whom I am well-pleased”? If he was not flesh, who fasted and hungered in the desert? And if he was not God, whom did the Angels come down and serve? If he was not flesh, who was invited to the wedding in Cana of Galilee? And if he was not God, who turned the water into wine? If he was not flesh, in whose hands were the loaves? And if he was not God, who satisfied crowds and thousands in the desert, not counting women and children, from five loaves and two fishes? If he was not flesh, who fell asleep in the boat? And if he was not God, who rebuked the winds and the sea? If he was not flesh, with whom did Simon the Pharisee eat? And if he was not God, who pardoned the offences of the sinful woman? If he was not flesh, who sat by the well, worn out by the journey? And if he was not God, who gave living water to the woman of Samaria and reprehended her because she had had five husbands? If he was not flesh, who wore human garments? And if he was not God, who did acts of power and wonders? If he was not flesh, who spat on the ground and made clay? And if he was not God, who through the clay compelled the eyes to see? If he was not flesh, who wept at Lazarus’ grave? And if he was not God, who by his command brought out one four days dead? If he was not flesh, who sat on the foal? And if he was not God, whom did the crowds go out to meet with glory? If he was not flesh, whom did the Jews arrest? And if he was not God, who gave an order to the earth and threw them onto their faces. If he was not flesh, who was struck with a blow? And if he was not God, who cured the ear that had been cut off by Peter and restored it to its place? If he was not flesh, who received spittings on his face? And if he was not God, who breathed the Holy Spirit into the faces of his Apostles? If he was not flesh, who stood before Pilate at the judgement seat? And if he was not God, who made Pilate’s wife afraid by a dream? If he was not flesh, whose garments did the soldiers strip off and divide? And if he was not God, how was the sun darkened at the cross? If he was not flesh, who was hung on the cross? And if he was not God, who shook the earth from its foundations? If he was not flesh, whose hands and feet were transfixed by nails? And if he was not God, how was the veil of the temple rent, the rocks broken and the graves opened? If he was not flesh, who cried out, “My God, my God, why have you abandoned me”? And if he was not God, who said “Father, forgive them”? If he was not flesh, who was hung on a cross with the thieves? And if he was not God, how did he say to the thief, “Today you will be with me in Paradise”? If he was not flesh, to whom did they offer vinegar and gall? And if he was not God, on hearing whose voice did Hades tremble? If he was not flesh, whose side did the lance pierce, and blood and water came out? And if he was not God, who smashed to gates of Hades and tear apart it bonds? And at whose command did the imprisoned dead come out? If he was not flesh, whom did the Apostles see in the upper room? And if he was not God, how did he enter when the doors were shut? If he was not flesh, the marks of the nails and the lance in whose hands and side did Thomas handle? And if he was not God, to whom did he cry out, “My Lord and my God”? If he was not flesh, who ate by the sea of Tiberias? And if he was not God, at whose command was the net filled? 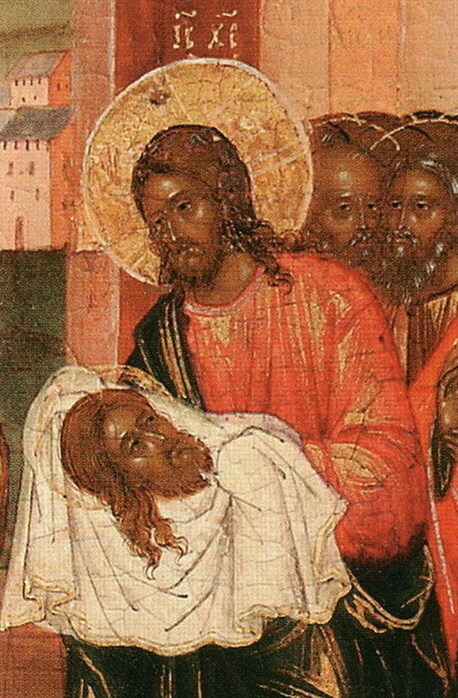 If he was not flesh, whom did the Apostles and Angels see being taken up into heaven? And if he was not God, to whom was heaven opened, whom did the Powers worship in fear and whom did the Father invite to “Sit at my right hand”. As David said, “The Lord said to my Lord, sit at my right hand, etc.” If he was not God and man, our salvation is a lie, and the words of the Prophets are lies. 16. But the Prophets spoke the truth, and their testimonies were not lies. The Holy Spirit spoke through them what they had been commanded. So too John the pure, who leant on the breast of flame, reinforcing the voices of the Prophets, speaking of God in Gospels, taught us when he said, “In the beginning was the Word, and the Word was with God, and the Word was God. He was in the beginning with God; all things were made through him, and without him nothing that was made, was made. And the Word became flesh and dwelt among us”. God the Word from God and only begotten Son from the Father, consubstantial with the Father; the One who is from the One who is, preeternal Word, ineffably born, without a mother, from the Father before all the ages. The same is born, without a father, in the last times from a daughter of man, from Mary the virgin, as God incarnate, bearing flesh from her, and becoming man, which he was not, while remaining God, which he was, that he might save the world. And he is the Christ, the Son of God, the only begotten from the Father, and only begotten from a mother. 17. I confess the same to be perfect God and perfect man, acknowledged in the two natures united hypostatically, or in person, indivisibly, unconfusedly and unchangeably; having put on flesh that is animated by a rational and intelligent soul, in all things becoming passible like us, sin alone excepted. He is both earthly and heavenly, temporary and eternal, starting and without beginning, timeless and subject to time, created and uncreated, passible and impassible, God and man, perfect in both, one in two and in two one. One person of the Father, one person of the Son, and one person of the Holy Spirit. One godhead, one power, one kingship in three persons or hypostases. So we glorify the Holy Unity in Trinity, and the Holy Trinity in Unity. In this the Father cried out, “This is my beloved Son, in whom I am well-pleased. Listen to him”. 18. All this the holy Catholic Church of God has received. In this Holy Trinity it baptises for eternal life. 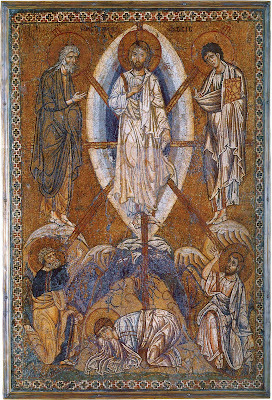 Into this Trinity it sanctifies with equal honour, confesses it without separation, without division; worships it without error, confesses and glorifies it. To this Unity in three persons belong glory, thanksgiving, honour, might, majesty, Father, Son and Holy Spirit, now and always, and to the ages of ages. Amen. Matt. 17:1-2. The reading ‘very’, rather than ‘apart’, is that of D. ‘Simon’ is not in the text of the Gospel. This sentence is frequent in the liturgical texts. In the second Kathisma for Christmas Matins it is given as a quotation, “But as it is written: ‘where God so wills the order of nature is overcome.’” But what is the source? It occurs in inauthentic texts attributed to St Athanasios and St John Chrysostom and in St John Damascene’s Sacra Parallela. Athanasios Quaestiones aliae [spur. ], Response 19 [PG 28:792, ll. 15-16]. Cf. Sermon on the Natvity [Sp. ], [PG 28: 960, l.28]. Chrysostom On the Nativity [dub. ], [PG 56: 385, l. 33]. John Damascene Sacra Parallela, [PG 95:1265, l.19]. In the first passage from Athanasios the text appears to be a citation. Cf. Baruch 3:38, one of the key ’incarnation’ texts from the Old Testament. This phrase forms the opening of the Dismissal for the first half of Holy Week in the Byzantine rite. John 17:5. Again the citation is free, omitting ‘with yourself’ after ‘Father’. This is odd, since the somewhat awkward repetition in the original would seem to be the explanation of the curious repetition in the previous sentence, ‘with[syn] the Father and together with [meta] the Father’. The former is the preposition used of the Holy Spirit in the Creed. There is also an echo of Philippians 3:6-8. This idea is a feature of the liturgical texts for the feast and is found in St John Chrysostom’s commentary on this passage. The same idea is found in St John Damascene’s homily on the feast, ‘Today the virgin of the old proclaims to the virgin of the new the good tidings of the Lord, the virgin born from a Virgin’. He does not name Elias and John, and it is more than likely that the words ‘Elias and John’ in the present text are a gloss that should be deleted, especially since the next sentence makes the references quite clear. Cf. Exodus 40:34-38, “Then the cloud covered the Tent of Meeting”. It is not clear whether these questions, as in the previous paragraph, are the imaginary words of Christ. I think it is likely and have therefore put them in quotation marks. Cf. Gen. 49:10. This verse presents many problems, of both text and interpretation. Many mss have the finite verb, as here. And this is the almost unanimous reading of the Fathers. Modern critical editions of the lxx prefer the participle, which is the reading of the great uncials. The following list of contrasting pairs of sentences to highlight the two natures of Christ is like a number of similar ones in the Fathers. In Greek there is one towards the end of St Gregory the Divine’s third Theological Oration, On The Son; another in St Cyril of Jerusalem’s fourth Catechetical Lecture. In Latin St Leo the Great has similar passages both in his Tome to Patriarch Flavian (Letter 28) and in his letter to the Monks of Palestine (Letter 124). In Syriac the list in Narsai’s seventeenth Homily, An Exposition of the Mysteries, most closely resembles the one in our text both in length and rhetorical form. Since the allusions to the Gospels are clear, I have not overloaded the translation with a list of references in the footnotes. In the liturgical tradition Symeon addresses his prayer the Infant in his arms. The chronology of the events surrounding Christ’s nativity implied by the order in this list is interesting. At first sight this ‘couplet’ is curious. All the others can be easily linked to specific incidents in the Gospels, whereas this one seems quite general, and the modern Greek translator gives no reference. It is, I believe, a reference to the healing of the woman with a haemorrhage, Matt. 9:20-22, where the Gospel mentions Jesus’ clothing, “If I only touch his garment, I will be made whole”. This goes some way beyond what the text says. That Christ’s body is one ‘of flame’ is a feature of St Romanos’ Kontakion 30, On the Apostle Thomas, though the references here are to the risen Christ. This confession of faith uses strongly Chalcedonian in language is unlikely, to say the least, to have been written by St Ephrem, who died some eighty years earlier. For more on the Great Feast of the Transfiguration, see: http://full-of-grace-and-truth.blogspot.com/2009/08/holy-transfiguration-of-our-lord-god.html.